(Huge Spoiler Alert below) In a vast sea of drug running movies involving the Columbian Cartels, this movie crashes and sinks to one of the bottom feeders. Tom is uninspired and phones it in as doomed amoral CIA dupe pilot Barry Seal. His entire operation comes off as a huge joke, as it turns out, one of the biggest problems with running drugs for the CIA and the Cartels is that you have issues hiding the money, as the numbers become non-sensical. 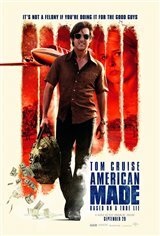 The movie properly portrays the CIA as Users and Abusers of hard working Americans, but does not properly go into their heavy involvement in the drug trade and hooking America on cocaine to fund their black programs. Fine for a rental, and largely forgetable, which is I'm sure how the CIA likes it. Very entertaining, while exposure to this serious issue. Tom Cruise is marvelous as Barry Seals..
Would be even better if B & H Clinton and the many murders surrounding their involvement in the drug/arms trade were included. Looks like the Multiple Movie Reviewer Troll hates Tom Cruise. Remember troll, one review will do! I actually like him as an actor, and enjoy most of his movies. This one was mediocre and almost TV movie of the week feeling. The only movie where someone gets blown off in his car and it actually looks like the real thing. No Hollywood style fireball. I feel Cruise does an amazing job at impersonating a character who actually existed and show both his good and bad sides, his strengths and weaknesses. A talented pilot who doesn't realize until it's too late he's just a pawn in a very dangerous game. Can you believe this stuff actually happened and US government civil servants firmly believed something good was going to come out of this mess ? I would probably have rated this movie at four stars however I’m giving it 5 to compensate for all the cynics out there that there is NO pleasing. You know the ones, “lousy movie, bad acting, another stinker from Tom”. This movie was fun and entertaining, I don’t think it’s supposed to “move you”. I honestly believe that for some of these movie goers there’s just no pleasing them. Here’s a little advice for them,...stay home and watch Netflix. Then put your rating experience to work by rating Netflix content, it needs it more then the movies in the theatres. And yes, another stinker for Cruise! Cruise can do no wrong. Best actor ever! Good story line, not much action, but really draws you in. Shows how some people are never satisfied with what they have, even though they have a lot and are willing to risk it all for even more. Everyone is supercritical of Cruise, but he did a commendable job in this flic. Worst movie of the year. Cruise needs to retire. There are more talented actors than him . He ruins every single movie. Good one, don't miss it. It wasn't very good. It was rather boring. It had no suspense. It felt more like a TV movie. Happened but the story was told like a Hollywood story. Made to fit Cruise’s movies. The last time I saw a good movie from Cruise was War of the Worlds. Enjoyed this fast based and somewhat fact based movie. Of course I do like Tom Cruise. The titles between the sequences gave the movie an interesting look and moved the action along. A perfect movie for Tom Cruise. True story only designed for Cruise. I don’t buy this movie. Cruise should retired or change his style. Same expression and tone of voice. No matter what character he is playing. Boring actor. Can't decide if this one is the worst or Happy Death Day.....ok, this one WAS the worst. Very real story from someone who lived and survived the '70's. Moral of the movie was well conveyed ... never trust our government. The sad thing is this happened and nobody cares unless it affects them personally. Sorry...I'm not an idiot. I knew it was based on a true story & the truth is Tom was bad. End of story. Happened and Hollywood changed the story like Disney does with all the movies. Only to show Cruise. Snoresville....Tom is such a has been. A Tom Cruise snooze fest. I really enjoyed this movie! Tom Cruise was great in it! I thought his acting was excellent. He hit all the emotions and facial expressions throughout though this was a comedy like version of the true story. The movie played well, kept my attention, just plain good. The flight scenes and location scenes were a bonus. I recommend seeing this movie. Very good movie, I'm not normally a TC fan but he brought an interesting character to life in a fascinating story line set in a true life setting. I agree...Tom is no longer a box office hit....he's lost the studios millions upon millions....guess they'll never learn! When will Hollywood realize that Tom is way past his prime - absolutely the worst actor maybe ever!